During manufacturing woven fabric in the weaving loom, defects are produced. Some of these defects are visible, while others are not. Again some defects may be rectified during weaving and after weaving, while others are not. Some common fabric defects have presented in this article with their causes and remedies. 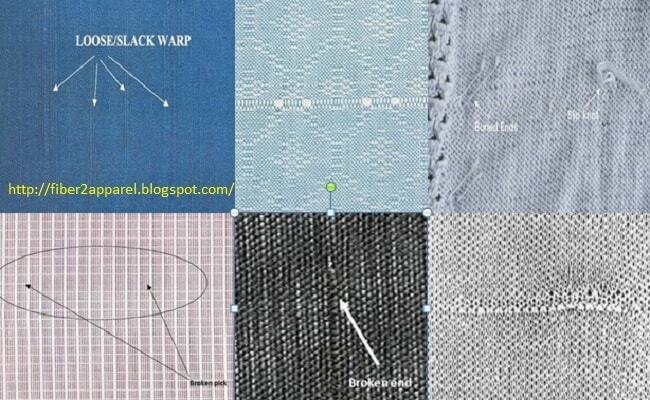 Some common fabric defects are explained here with their major causes are remedies. If a warp yarn is absent in the fabric for a very short or long distance, and then the defect is termed as broken ends. To avoid this defect, loom motion should keep in the right position. If a weft yarn is absent in the woven fabric for a very long or short width it is known as broken picks. Loom motion should be maintained properly to avoid this defect. It is one type of defect where a weft or warp yarn floats over the fabric surface for a new centimeter lengths due to missing of interlacement of two series of yarns. The weft curling defect is produced by inserting highly twisted weft yarn or weft running too freely. As a result it causes twisted of weft yarn and appear on the surface of woven fabric. When the weft yarn is unclean and contains slugs and its diameter is irregular, the defect appearing on the cloth is termed as slugs. Stitching is a major defect particularly in good quality fabric. It is a common fault in which the ends and the picks are not interlaced according to correct order of the pattern. If pick density i.e. picks per inch (PPI) varies due to the mechanical defect then thick or thin place may be produced in the woven fabric. The fibers in the yarn have been roughened before, during or after weaving. If there is any small holes present in the fabric and then it is a major defect. This type of fabric defects are produced on the fabrics due to the application of by too much oiling on the loom parts or from other sources. However, oil stains in most fabrics may be removed by scouring process. This type of fault or defect is termed as “starting place” in cloth are caused as a result of stopping and starting a loom. The fault appears width way of the woven fabric. Depth of shade of color may varies from one place to another place along the length of the fabric when a role of fabric is dyed, is termed as shedding. If the grey fabric is made of cotton and in the cotton, polyester or other synthetic fiber is mixed to a negligible amount, after dyeing the polyester fiber remain white, showing white spot in the fabric. Sometime narrow stripe like color shedding affect is found due to dyeing defect or fault in the solid color dyed fabric is termed as running stripe shedding defect. Due to knots, slubs, neps etc. present in the fabric, after dyeing, those places appear as a colored spot.